No one could have thought that we could book seats at our favourite restaurant and get a discount for the same and get all of it done online, without any hassles! At least, not a decade or to be precise a few years ago! However, today this happens to be a reality. Thanks to online shopping, coupons and promo codes and the presence of platforms like HappySale that has made it possible. And one of the popular online portals through which you can have access to the same is Dine Out. 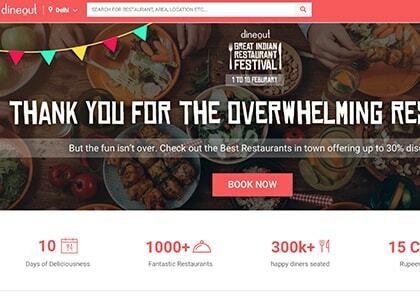 A portal that allows you to select restaurants from its existing list and also get 20% promotional offers and many other forms of discounts and cash back deals, DineOut is a top favourite amidst a broad spectrum of audience. So all you have to do is browse through DineOut and select the best deals that are available, read the descriptions and activate the same. Reserve a table for free at best restaurants in Delhi and also get additional upto 30% cashback at Dineout. Look on to the landing page where you can choose from various restaurants and make avail of this best deals. No discount or cashback coupons required to make avail of this offer. Get now! Choose from various best restaurants online and reserve a table for free with Dineout. Look on to the landing page where you can pick a restaurant and reserve a table for FREE. This offer is valid in various cities like Delhi, Mumbai, Bangalore, Chennai, Hyderabad, Pune, Kolkata & Ahmedabad. No coupon codes required to get this offer. Avail now! Buy membership at Dineout and get flat 25% off on all the restaurants. Look on to the landing page where you can buy this Dineout membership worth Rs 5000 and make avail of this discount offer. No voucher codes required to make avail of this deal. Hurry up and avail now! Get upto 15% off + extra upto 30% cashback on buffet deals at Hyderabad. Look on to the landing page where you can get this buffet deals in various restaurants like Urban Asia, Malaka Spice, Little Italy, Feast-Sheraton, Saffron Soul and more. No promo codes required to avail this cashback offers. Get now! Dineout Buy 1 Get 1 Offer: Avail best happy hours deals at Bangalore restaurants. Here you can get flat 10% off + additional upto 20% cashback + Buy 1 get 1 FREE on drinks. Look on to the landing page where you can choose from various restaurants and make avail of this exclusive offer. No promo codes required to get this offer. Whether you happen to be a foodie or not, eating outside has a charm of its own! Once a week or month or once in two weeks if you along with your close friends or family, get to your choicest restaurant or a new eatery to experiment with a new cuisine it somehow adds to the feel good factor of life! So all you need to do is search online as you have the chance to book seats at a best restaurant online and also earn great discounts for the same. The brand Dineout makes it possible for you. And for the discounts and offers you have search by typing in Dineout coupons and select your best deal. If you are wondering where you can have access to the best and multiple offers by Dineout online under one roof so that you can browse at your own free time and select the deals you like best, then the best website to refer here is HappySale. Here you have the best deals listed for you that have something to offer to everyone. So whether you are planning a family brunch, lunch or dinner or just a simple eat-out on a weekend you can add ease to the planning by simply booking a table online with just a click of the mouse and also get the best discounts for the same. Furthermore, when you have the chance to make the most of the Dineout promo codes you can add to your savings in a huge way! For instance, when you are booking the restaurants at Delhi, then you have a chance to enjoy a cashback deal of 30% and sometimes even more. Other offers allow you to book your table free at a restaurant of your choice, which also adds to your savings. There are many other site wide deals and promotional offers as well. Sometimes, you can get a good discount on your first booking as well. This is done to woo in more and more customers to use this brand! Discounts and offers like this is always useful! So once you are happy making use of the same to treat your close friends, you can refer the same other set of friends and also your family members so that they too can enjoy the benefits. For the ones who want to select from the best, latest and the authentic Dineout coupon codes, all you need to do is keep browsing from HappySale as this is an ace website for all your discounts and the like! So read the deal descriptions and then decide which offer you want to activate and get it done before the offer expires.